BASIC is part of the DNA of Microsoft, and we have continued to evolve the language for most of the 40 years of the company’s existence. In the next evolution of the language, Visual Basic 14, there are a number of great features that are being added and we want to make sure that you know we are fully supporting them with ASP.NET in Visual Studio 2015. 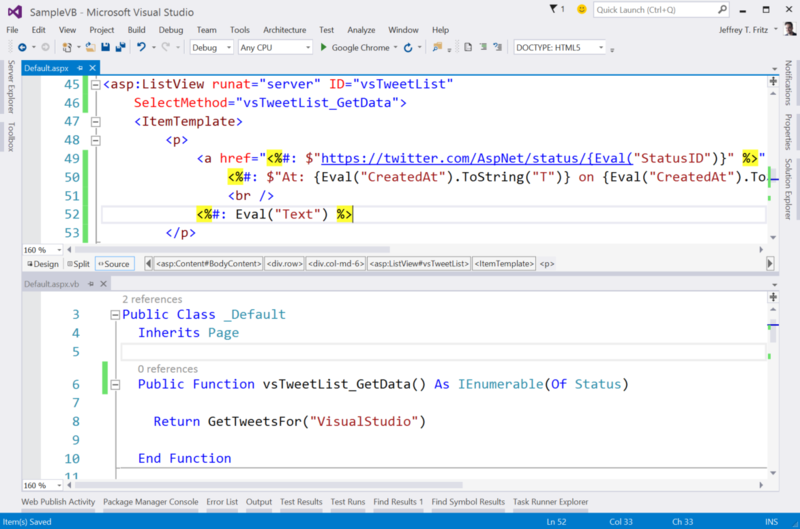 Let’s take a look at a few samples of how using Visual Basic with ASP.NET 4.6 makes developers more productive and their code more readable. Now our string looks more readable, just like the razor syntax without having to scan back and forth across the code. Values inside of curly braces in our text are interpreted as code values to be inserted at that point in the string, just like our previous String.Format text format but without the annoying back and forth reading for us humans. This feature isn’t limited to just ASP.NET use, as you can use it in all of the .NET frameworks that support Visual Basic 14. As someone who reads stack traces and debugger output, this helpful bit of information that the previous developer attempted to provide for me no longer makes any sense. Now that error statement makes more sense for the next developer who will be maintaining your code. Asynchronous operations have been available with the Task Parallel Library since .NET 4 in 2011. It’s been around for a long time, and Web Forms just has not had a chance to really feel that love in the more complex interactions that they host. Let’s face it, Web Forms is the event-driven model that could have significant problems if an event is not finished an asynchronous operation when the next event is about to start. It’s a complex model, but in the latest update to ASP.NET 4.6, we have opened the web forms model to allow Asynchronous Model Binding operations with the Task Parallel library. Let’s take a look at how easy it is to migrate an existing set of controls to model binds asynchronously. The ItemType argument on the ListView provides strongly-typed databinding capabilities. This allows me to avoid the magic-string problem with databinding syntax like Eval(“Status”) If Status was misspelled or did not appear in my data object, I wouldn’t see an error until the page was requested. By using the ItemType, all of the references to Item in this control are strongly-typed and I get editor intellisense assistance. Notice I used the new string interpolation feature from Visual Basic in the date format. While not entirely necessary, it just felt cool to be able to write that as a complete sentence. That would normally work really well, fetching the data and loading it into my resultant HTML very quickly. In this case, I want to load two sets of tweets. That means two requests to Twitter to load data and blocking page processing while those two requests are fulfilled by the Twitter APIs. Seriously, that’s all that you need to do in order to allow your requests to fire asynchronously. Just add the async keyword, return a task, and await the asynchronous method call. Now, both of my requests to the Twitter API will fire at the same time, the ASP.NET runtime will manage the threads that call the API and ensure that they are all processed before returning the page to the requesting user. 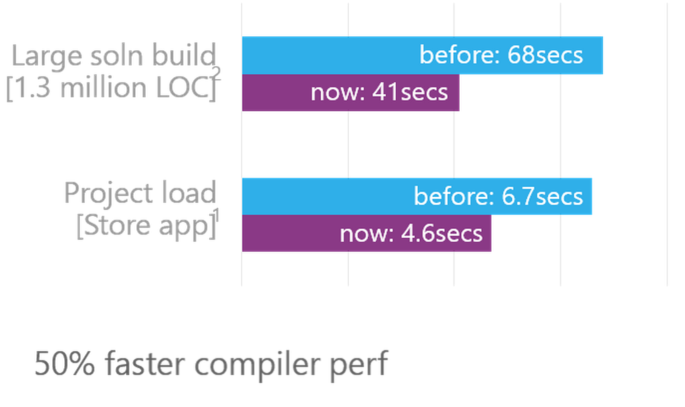 With the introduction of the new Roslyn compiler, you now have a turbo-charged ASP.NET compiler experience. In the tests in our lab, we have measured an almost 50% speed increase for Visual Basic developers at compile time. However, we didn’t stop there. Since May 2014, there has been a NuGet package available called “CodeDOM Providers for .NET Compiler Platform (Roslyn)” and wow was that hard to find. Only 600 downloads of this package have been recorded at the time of this article’s writing, and that’s a real shame. This package activates the Roslyn compiler for ASPX page parsing and compiling. Do you remember waiting for the compiler to re-interpret your ASPX pages each time you change HTML formatting? This package cuts that time significantly, but is in pre-release mode and only works for C#-based ASPX files. With the coming release of Visual Studio 2015, we are going to release a 1.0 version of this package and add Visual Basic support. 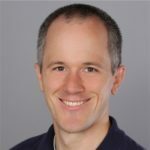 We’ve talked about ASP.NET 5 as a major update of the ASP.NET framework with Roslyn and cross-platform support in mind since our initial public discussions. It is not a short path, and we focused initially on completing support for C#. In the months since our initial announcements, we have heard from many of you, telling us how much you like Visual Basic and that they want to see support for it in ASP.NET 5. We are excited today to announce that ASP.NET 5 will have full support with Visual Basic (both tooling and runtime – including cross platform runtime support). As always, we will continue this development of ASP.NET 5 in the open, and you can track our progress or even contribute on GitHub at http://github.com/aspnet/home. Visual Basic, ASP.NET and even Classic ASP before that have had a long history together. We’re committed to that partnership, and we will continue to evolve the Visual Basic story with ASP.NET. You can learn more about the new features in Visual Basic 14 from Lucian Wischik and from Kathleen Dollard in a pair of snack-sized five-minute videos.